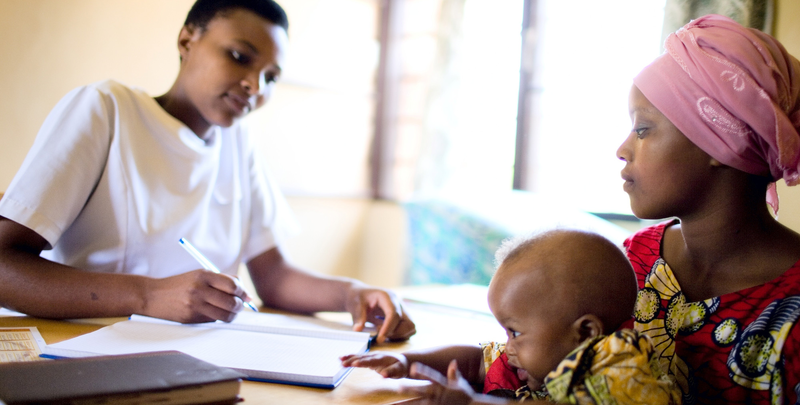 Despite a major shortage of health workers, Rwanda has become something of a model for sustainable health programming. Photo by Charles Harris for IntraHealth International. Countries need good health governance at all levels. When he was just a little boy, my colleague Peter woke up in the middle of the night to hear his mother shouting for him. His baby sister was terribly ill, and Peter’s mother needed him to run fetch the village nurse. He did—through the pitch-black darkness and the pouring rain. Their village in Kenya did not have electricity or cell phones at the time, but they knew they could count on nurse Winifred, because she was highly skilled, and always close by. This nurse’s proximity to the people who needed her saved a baby’s life that night. And who can say how many others in that remote part of Kenya are alive today because of her? When it comes to improving global health, we know that health workers are essential. Fortunately, more countries today are working hard to make lifesaving health services available closer to the people who most need them. Decentralization—or the process of shifting greater authority to manage health care from the central to the local level—has been key in many countries. In Kenya, it is transforming health care in areas such as Turkana County, in large part because of its booming health workforce. And Senegal is making great progress toward this shift as well, in part by investing in community health workers and integrating them into the overall health system. When it comes to improving global health—whether it’s reducing the number of women who die in childbirth or eradicating malaria or making modern contraceptives available more widely—we know that health workers are essential. We need more nurse Winifreds, and we need to ensure they are not clustered only in the cities, but available everywhere people live. Last week, I had the opportunity to travel to Rwanda, where the Minister of Health, Dr. Diane Gashumba, told me about the country’s continuing efforts to strengthen its health system, especially at the district level. Rwanda has a major shortage of health workers, including qualified physicians, but it has also made tremendous progress and become something of a model for sustainable health programming. Today it is clean (plastic bags have been banned for the past decade), efficient, and populated by a young workforce that is motivated to rebuild. Rwanda’s ongoing efforts to strengthen district-level management of health services are a smart move. It shifts the authority—and responsibility—to make decisions about spending and services to those who are closest to the need, which is precisely where it must be. We saw a 75% spike in the number of women who went to health facilities to deliver their babies. We’ve seen the benefits of this in the past. When IntraHealth International worked with the Rwandan government to provide funding directly to the districts through the USAID-funded Twubakane Decentralization and Health Program, we saw a 75% spike in the number of women who went to health facilities to deliver their babies under the care of skilled birth attendants. And this was in districts where clients used to avoid the health facilities. By giving individual districts the support they need to govern themselves, countries such as Rwanda can see vast improvements in maternal, newborn, and child health, disease control, nutrition, reproductive health care, and more. If districts or even villages have the power to make their own budgets and decisions for health care, services are more likely to happen. The further from the community those powers lie, the more geographic and economic barriers clients will encounter. The countries that have had the greatest success in family planning are the ones that have made the effort to take these services to the people, in part by giving local health officials more control over health care. Indonesia, Thailand, and Singapore, for example, have created favorable policy environments, relaxed the laws that were holding their programs back, and invested greatly in their community health workforces. Thailand has essentially destigmatized family planning and made it a mainstream way of life. And now many of the African countries that are working to emulate them—such as Senegal and Rwanda—are seeing success as well. In Rwanda, the use of modern contraception rose from 4% in 2000 to almost 50% in 2007. The US must invest in the people at the center of all our global health progress: health workers. The United States has been a driving force behind many of our global health successes in low-income countries around the world. During a congressional briefing on Capitol Hill earlier this month, my colleagues at the Frontline Health Workers Coalition and I spoke with members of Congress about the results of this country’s robust leadership and investment, and about how our continued investment in Africa (and beyond) is imperative. This means investing in the people at the center of all our progress: health workers like nurse Winifred. When health services are available, when their quality is high, and when health workers are present and ready to do the job, there is no limit to the number of lives we can save. To do this, though, countries need good health governance at all levels. The future of women, men, and families everywhere depends on it. IntraHealth’s work in Rwanda was funded by the US Agency for International Development, along with the William and Flora Hewlett Foundation, the David and Lucile Packard Foundation, and the Tides Foundation. Read more about IntraHealth's work in Rwanda.